*I was sent a bottle of Purex plus Clorox 2 to review. All opinions and horrific messes are my own. Once again I am literally displaying my dirty laundry. The napkin pictured above was the nearest thing to me when I went to wipe up an unfortunate pasta sauce incident. 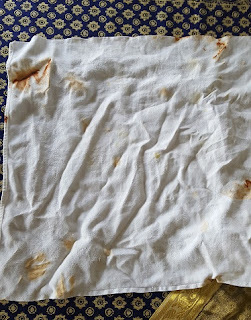 In our house, we don't tend to use paper towels. We never have. Instead we use dishrags and cloth napkins. I've written before about the genius of using red napkins. Obviously, those were not available at the time of the aforementioned saucy explosion. 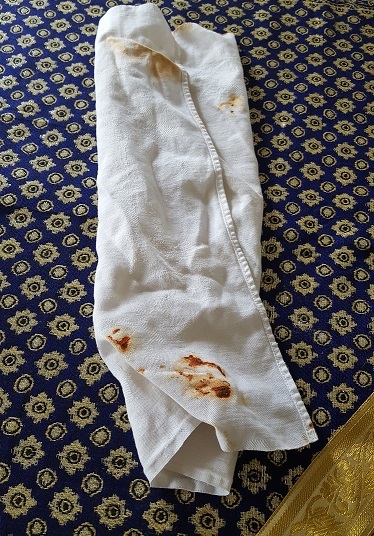 And although for the three of us well warn napkins aren't a big deal, I'd rather not have my guests use napkins that look like they've been used in a crime scene. 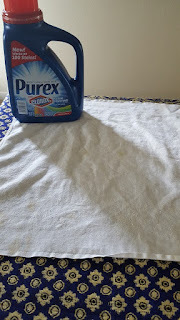 Fortunately for me, the good folks at Purex had recently sent me some detergent to review. This is not just any detergent but detergent with the stain fighting action of Clorox bleach. Boy did I have a doozy of a test for that stuff. Not only was the napkin heavily stained, it was found in the bottom of the laundry pile days later. Since the stains were so caked on, I followed the directions and pre-treated the areas with the liquid detergent for 5 minutes before washing the load. Did every trace of sauce get removed? No. Would I be embarrassed to use the napkin in front of non-Moppins family members? No. My only real issue with the detergent was that it was a bit heavy on the scent. I prefer a lighter perfume in my detergents. Saying that, the laundry out of the dryer did not have that strong of a smell. I feel like the Purex plus Clorox 2 did the best job I could hope for seeing as those stains were thick, sticky, caked on, and had been there for several days.